The Pacific War Online Encyclopedia: Woodruff, Roscoe B. Table of Contents Next: Woods, Louis E.
Woodruff was slated to command a corps in Europe, but Eisenhower turned him down because of Woodruff's lack of combat experience. Marshall assigned him to train a division, then sent him to the Southwest Pacific, where, he was to have commanded the Yap garrison. When the Yap invasion was canceled, he accompanied the invasion force for the Leyte campaign. 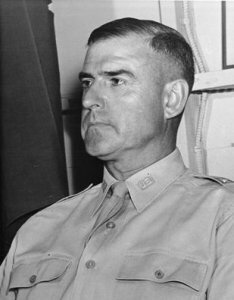 Krueger gave him command of 24 Division in the latter part of the campaign, after relieving Irving without explanation, and Woodruff led the division during the assault on Mindanao in 1945. During the Mindanao campaign, Irving fell into a Japanese spider hole and cracked several ribs, but refused evacuation in spite of being in severe pain. Eichelberger came to regard Woodruff as his most reliable division commander.